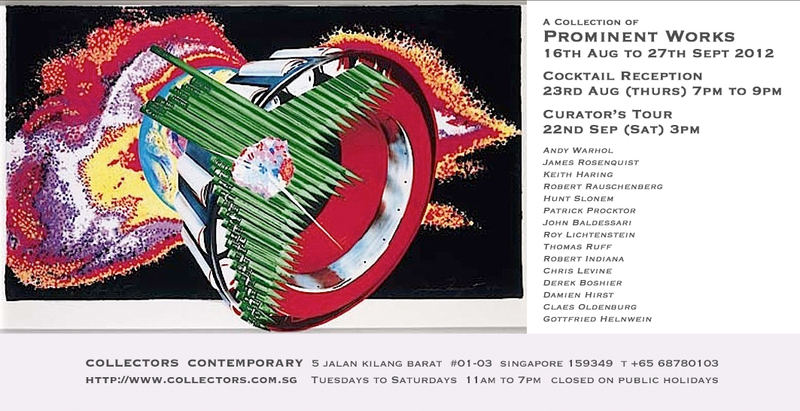 Collectors Contemporary is delighted to announce the very first solo STATIC exhibition in Singapore. STATIC are a London-based collaborative duo. 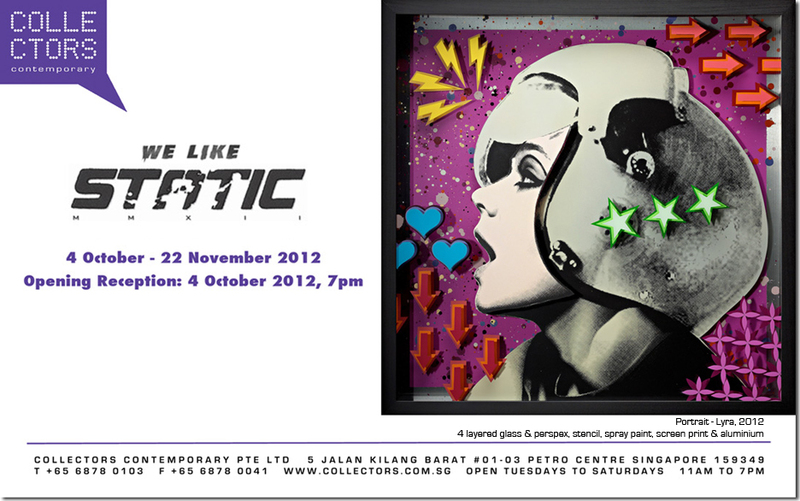 Their fresh ultra contemporary works combine graffiti inspired urban iconography with fine art. Using stencils, screen-printing, spray paint, and paintbrushes they produce unique artworks that are instantly recognisable for their polished graphic style, luxurious electric colours and layered imagery. This exhibition presents important artworks in context. Exploring the meanings and narratives associated with rare or iconic pieces of art from the 1960s to the present day. John Baldessari, Derek Boshier, Keith Haring, Gottfried Helnwein, Damien Hirst, Robert Indiana, Roy Lichtenstein, Claes Oldenburg, Patrick Procktor, Robert Rauschenberg, James Rosenquist, Thomas Ruff, Hunt Slonem, and Andy Warhol. 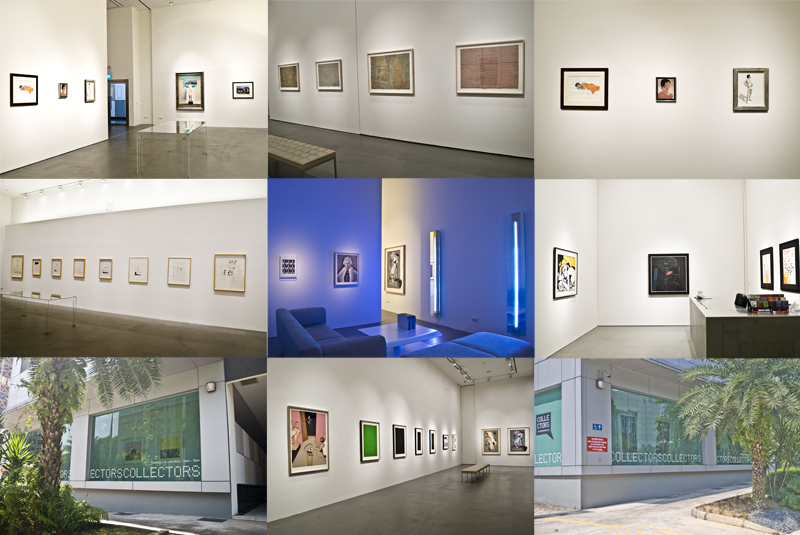 Collectors Contemporary will be holding a Curator's Tour, tomorrow 22 September at 3pm! The tour accompanies their current exhibition "A Collection of Prominent Works" - exploring the meanings and narratives associated with rare of iconic pieces of art from the 1960s to the present day. Collectors Contemporary is proud to represent Chris Levine, one of the most in demand contemporary artists working today. 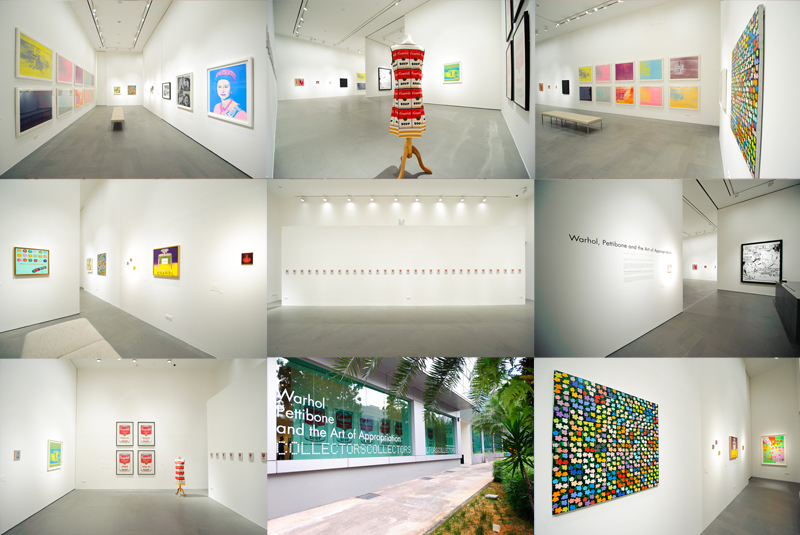 We are presenting a changing selection of his works in a specially curated annex within the gallery. 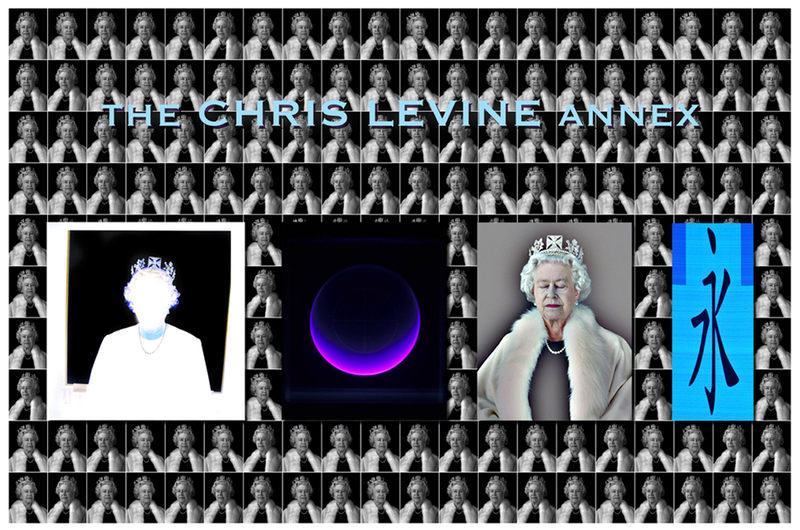 In 2004, Levine made history when he created Equanimity, the first ever 3-D holographic portrait of Queen Elizabeth II, commissioned by the Jersey Heritage Trust to commemorate 800 years of allegiance to the crown. In June 2012 Equanimity appeared on the cover of TIME Magazine. 2012 marks a pivotal year for the artist. In the year of the Queen’s Diamond Jubilee, Levine’s work is featured on specially commissioned UK postage stamps and £100 commemorative bank notes. This year, the artist has worked with the luxury brand Asprey to create a new holographic image of Queen Elizabeth II embellished with a real diamond diadem. The portraits, Lightness of Being and Equanimity, are currently featured in The Queen: Art and Image at London’s National Portrait Gallery. Levine is a groundbreaking contemporary artist. He employs a distinctive visual language that combines advanced technology, beauty and philosophical reflection. The single thread that runs through his oeuvre is light - from light sculptures that exist as dramatic and poetic interventions in space, to portraits that use transitions of light to powerful and meditative effect. Levine uses light in diverse formats such as laser, holography and LED (Light Emitting Diode). Technology is a means to an end for the artist. He is concerned with the inherent power, beauty and spiritual dimension of light. Levine’s work explores and rewires our sensory perception. Levine creates new visual and auditory adventures for the viewer to participate in. Levine has worked collaboratively on multi-disciplinary projects to achieve innovative and unparalleled sensory experiences. Working with the British electronic trip hop group Massive Attack at Glastonbury Music Festival in 2008, he used laser projected through oscillating prisms, and LEDs directed at the viewer’s peripheral vision. In 2009, after Razorlight and Paul Weller performed at the Eden project Levine used the transformative power of laser light to showcase his experimental sound and vision work entitled; iy_project*. In 2010, Levine was celebrated for his portrayal of the iconic Grace Jones in his exhibition Stillness at the Speed of Light. At the beginning of 2012, Levine worked with the Museum of Modern Art, New York, the 60 piece New York Symphony Orchestra and Antony Hegarty. Hegarty performed with the orchestra while Levine produced an experimental laser light installation projected onto a crystalline sculpture. The artist has received commissions from organisations such as Cartier, BMW, Swarovski and Mario Testino for Tom Ford. Levine’s work combines progressive technology and artistry in a distinctive visual language that is both poetic and ultramodern. Levine’s work is without precedent and his relevance in the contemporary moment cannot be overstated. A dynamic look at art appropriating languages of consumerism. This session is part of our community arts outreach programme. There is no charge. 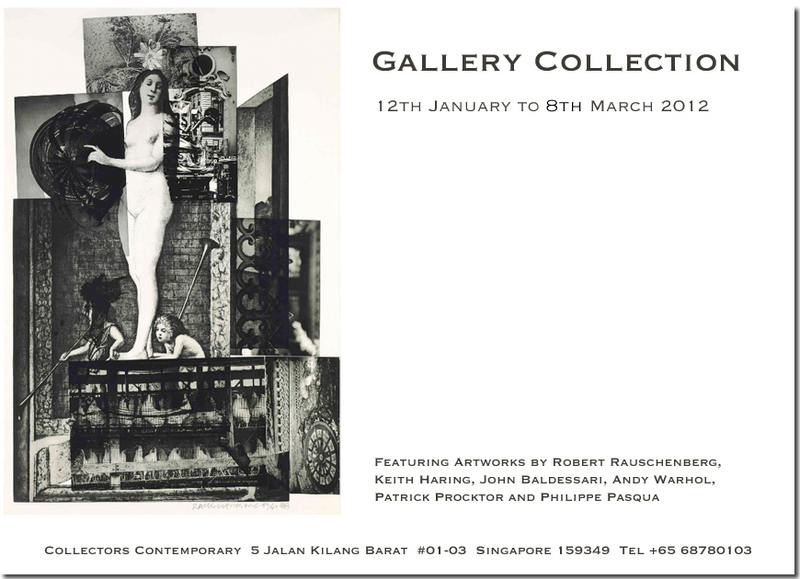 Please email events(at)collectors.com.sg to reserve your seat. Warhol, Pettibone and The Art of Appropriation brings two groundbreaking artists together in a dynamic conversation about what appropriation means: its cultural and historical significance. This unique exhibition presents an opportunity for visitors to acquire celebrated works by Andy Warhol and Richard Pettibone and to take a focused look at their significance in art history. To appropriate is to borrow an image and create a new meaning. The act of choosing an existing image or object and re-contextualising it is an artistic and conceptual act that resonates throughout art history. Warhol pushes our understanding of appropriation even further. By taking the everyday as source material and making art, the artist dissolved any distinction between "high art" and popular culture: between art and life. 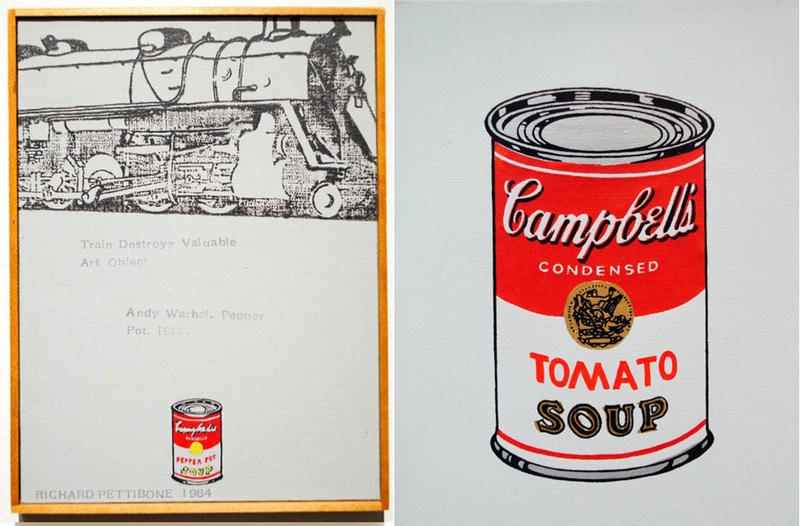 In the 1960s Richard Pettibone began producing unique miniature reproductions of artwork created by modern masters such as Andy Warhol, Roy Lichtenstein, Jasper Johns and Frank Stella. These small jewel-like works are celebrations of the original modern masterpieces. 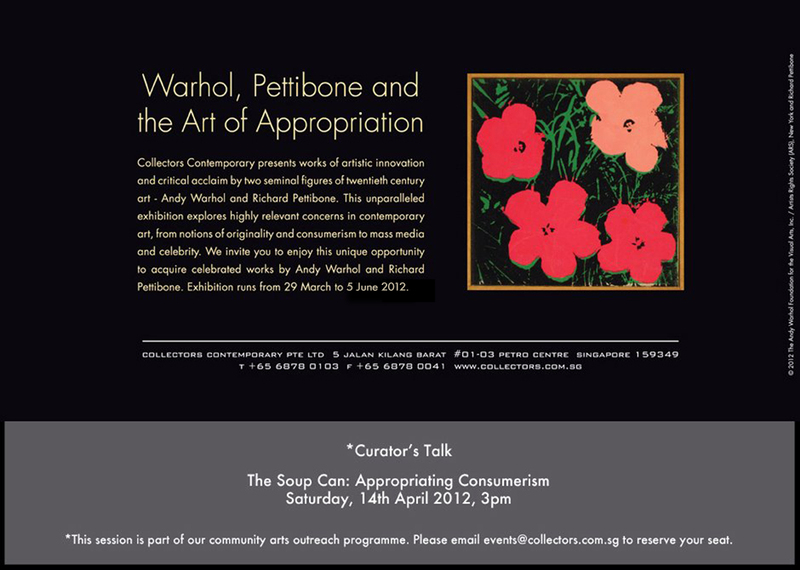 Warhol, Pettibone and the Art of Appropriation presents work of masterful skill, critical acclaim and artistic innovation by two pioneers of appropriation. 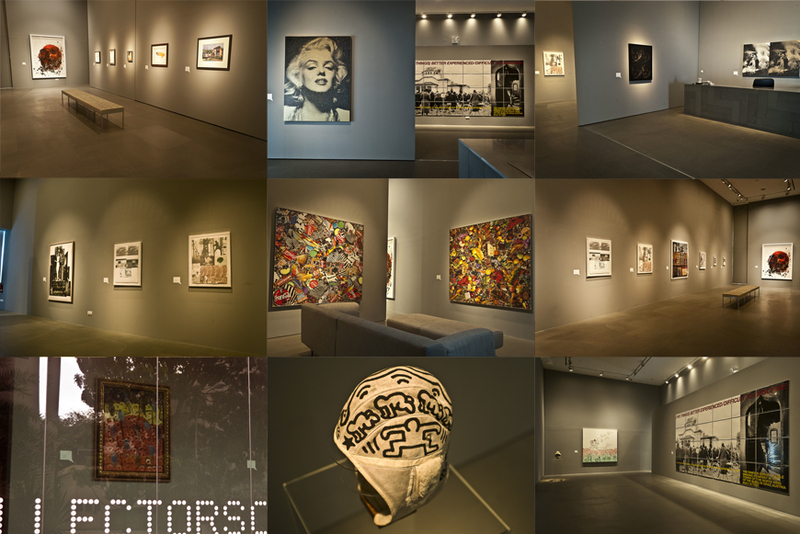 Collectors Contemporary specialises in the exhibition and sale of important works of modern and contemporary art. We are committed to featuring compelling and provocative works by masters as well as emerging and mid-career artists, catering to private collectors as well as institutional and corporate collections.